Open Registration for Fall 2019 begins January 30, 2019 at 9 am. Call now for a tour!. Classes are offered for children 18 months through Kindergarten. Each class is staffed by highly qualified and experienced teaching professionals. All classes meet from 9:30 a.m. to 1:00 p.m. from September through May. A morning snack is provided and each child brings his or her lunch. Through a variety of planned activities which include physical activity, group interaction, art, language, science, music, number exploration, movement and dramatic play, children will grow and develop a good image of their own self worth as children of God. Spanish with Señorita Mercedes Ramirez for the threes, fours and kindergarten classes is once a week and for the 2-day 3's, music and Spanish is twice a month. Mud Puddle Science, LLC with Jody Ullmann is offered to our 4’s and kindergarten classes once a month. Music and Chapel are offered once a week to our classes. Monthly themes provide a foundation for each student. Teachers use age appropriate exploration in the classroom. The monthly themes are supported by special guests and / or field trips. There is a Christmas Music Program in December and a Spring Music Program in May each year. There are 3 Summer Camps (one each summer month) that are offered for 3 to 6 year olds each year. Children must be potty- trained to attend each camp. Each camp meets on Tuesdays, Wednesdays and Thursdays from 9 am to noon for 2 weeks each summer month. Classes consist of five students between the ages of 18 months and 2 years 6 months by the 30th of September. Students attend one assigned day each week. Each class has a teacher and an assistant teacher providing a low staff to student ratio of 2 to 5 insuring individual attention and care. Story time, music, outdoor play and art are a daily part of the program. Classes consist of 12 children who are 2 years 6 months by the 30th of September. One of the classes meets on Tuesdays and Thursdays and one meets on Wednesdays and Fridays. Both classes have a teacher and an assistant teacher. Story time, music, outdoor play and art are a daily part of the program. Chapel is offered once a week. Classes consist of 14 students who are 3 years old by the 30th of September. Students must be potty trained. The 2-day 3's classes meet on Mondays and Wednesdays. The 3-day 3's classes meet on Tuesdays, Thursdays and Fridays. All classes have a teacher and an assistant teacher. Letter puppets are introduced weekly to assist with learning letter and phonic concepts. Story time, music, outdoor play and art are a daily part of the program. Chapel and Spanish classes are offered once a week. Classes consist of up to 16 students who are 4 years old by 30th of September. The 4-day 4's classes meet Tuesdays through Fridays. The 5-day 4's classes meet Mondays - Fridays. All classes have a teacher and an assistant teacher. Letter puppets continue to reinforce letter and phonic recognition each week. Story time, music, outdoor play and art are a daily part of the program. Computers are in all 4's rooms and Chapel and Spanish are offered once a week. Science is offered once a month. The Kindergarten class consists of 16 students who are 5 years old by September 30th. The class meets Mondays - Fridays with a teacher and an assistant teacher. The curriculum meets the state's SOL requirements. Virginia School Entrance Health Form with an up to date shot record (required yearly) before the first day of school. Go to: http://www.doe.virginia.gov and download a health form for your child. Tuition is divided into nine equal payments due one month in advance from August 1st to April 1st. A late fee of $15 applies if tuition is paid after the 10th of the month. The Preschool and Kindergarten operate on the funds provided by tuition and fees. 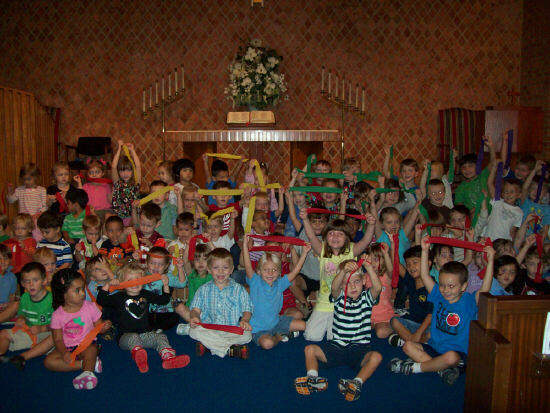 Bayside Presbyterian Preschool and Kindergarten is operated as a part of Bayside Presbyterian Church's (USA) educational program and as an outreach ministry. The school is supervised by the Session of the Church. The school's Director works with the Administrative Support Ministry, the pastors and the school staff to ensure that quality care is provided in a stimulating and nurturing environment. Those interested in the school are invited to call during school hours to discuss any openings and to arrange a visit. origin, or any other basis prohibited by law.